The next stop on my Food Ethnography quest takes me right to our own backyard, and the foods and cuisines that have existed on this continent for thousands of years. That would be the many food traditions of the native peoples of North America, which of course influenced what the first Europeans and Africans in what is now the Eastern United States ate sooooo much later. Since we are talking about Thanksgiving, I will focus specifically on what anthropologists refer to as the Eastern Woodlands cultures. The original Thanksgiving took place in the Northeastern Woodlands. I won't focus there exclusively, but I will focus there mostly. Located in: North America, spanning from Ontario and Minnesota in the northwest to Illinois in the southwest, and from North Carolina in the southeast to New Brunswick in the northeast. Maryland, by the way, is part of this region. Number of cultures: many, many, many of them. Some of the native nations in Maryland include the Piscataway-Conoy. Sadly, none of Maryland's native nations are federally recognized as of 2009. Number of Northern Eastern Woodlands restaurants in the DC area: 1 - the Mitsitam Café in the National Museum of the American Indian. The café also has foods from indigenous peoples in many regions of North, South and Mesoamerica. "Mitsitam" means "Let's eat!" in the Delaware and Piscataway languages. Kind of like: very, very local, without ingredients that are native to Europe, Africa, Asia or other parts of the Americas. There is no one, monolithic "Native American cuisine" - that would be like saying there's just one, monolithic "European cuisine." It just doesn't exist. Instead, there are many, varied Native American cuisines, probably as varied as the indigenous nations that exist in what is now the United States. But it is easier to find common foods within each "culture area" of Native America - such as "Southwest" or "Great Plains" or "(Northern) Eastern Woodlands." Let's take the Northern Eastern Woodlands region - an area that stretches from New Brunswick, Québec and Ontario in the north to Illinois, Kentucky and North Carolina in the south. Foods that were indigenous to this area before the 1500's include foods that were always found here - such as venison, fish, hickory nuts, acorns and our own blue crabs, hon. It also includes foods that found their way from farther south - such as corn, beans and squash, which journeyed from Mesoamerica (where the Aztecs and the Maya live) through the Southwest and into the Eastern Woodlands. 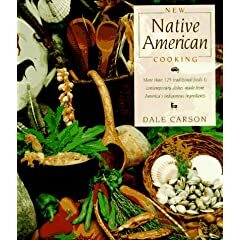 Even though there is no one "Native American cuisine," that has not stopped Abenaki chef Dale Carson from starting to compile a type of Native American cuisine with her book New Native American Cooking. Carson relies heavily on the traditions of her own heritage, while creating, updating and introducing to all Americans the foods and recipes of Native America for the modern kitchen. I will be relying heavily on Carson's book for various recipes for the next few posts. Keeping this in mind, I will probably be integrating some of these very same ingredients that Carson incorporates into her recipes. But for the recipe in this post, I will make things hard for myself by doing the "purist" thing. I will try to use only ingredients that people in the Eastern Woodlands were using 500 years ago. This won't be completely possible, but I'll do it whenever I can. One of the most common game animals in the Eastern Woodlands was deer. Just look at all the deer running around today and you'll see just how plentiful a resource deer is. Many cooks would have made stews out of deer in this part of the world. Fortunately, I had some venison in the freezer, shot, killed and dressed by my sister's father-in-law. If you have none laying around, you can buy some, but it'll be pricey. Bison and rabbit are other animals you would have found in North America - though bison did not really roam around the East Coast 500 years ago. These meats are also pretty damn pricey, so if you're broke you might just want to make a regular old stew with non-native ingredients, like beef or chicken. 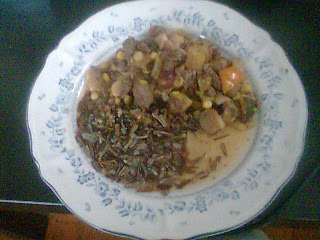 The mother adds some things to a venison stew she will be cooking soon, and the son brings to her some wild onions he has just gathered. The fire has not been started yet, but after the dried corn (which hangs to the left of the wigwam door) has been added to the mixture, the clay pot will be suspended over the fire and the stew will simmer slowly for hours. To the stew she will add some of the maple sugar in the birchbark makak container behind the hearth. The woman will use the long wooden paddle to stir the stew occasionally, and when it is finally done, she will serve the food in the birch bark dishes which sit on the woven mat in front of the hearth, using the carved wooden ladle which sits now in the other clay pot to the left. Since I don't have the time to stand around and stir all day, I'll be using that incredibly modern convenience, the slow cooker. Of the things I have on hand, venison is the key ingredient. I have about a pound and a half of it in my freezer. Added to that are things I have bought recently: some shallots and green onions I bought for the Cambodia project (since I have no wild onions on hand, these will have to do), and dried lima beans. 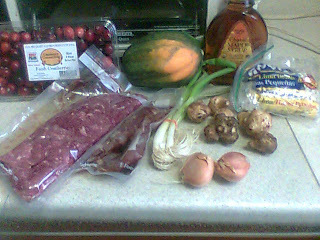 Added to that are some other Native American foodstuffs I bought for this and the next few recipes: an acorn squash ($1), sunchokes - at the root of the sunflower ($3 per lb at Wegman's; I got about 1/2 lb), a bag of frozen corn ($2 - everyone is out of corn on the cob), some cranberries ($3 for a 2 lb box - I'm using most of these for Thanksgiving but I will experiment with a handful of these), and the kicker - maple syrup. Okay, get the "EWWWWW's" out. Maple syrup? In a stew? Having not grown up anywhere near New England, maple syrup was not exactly a staple in my home growing up. In fact, I think I've only ever bought one bottle of maple syrup in my life. And maple sugar and syrup was not really used much farther south than New England and southern Canada. Still, I am intrigued at the prospect of using it in place of refined sugar. And I only need a little bit. At $8 for a 12 oz bottle, it is easily the most expensive ingredient, but I'll be using this stuff in a few different ways. So it's worth the expense, I think. Every recipe I have read suggests that I brown the venison in a skillet before transferring it to the slow cooker. After doing that, I just dumped it in the slow cooker. To that, I added the acorn squash - which really went far - 1/2 lb sunchokes, 1/2 bag frozen corn, 3 green onions, 2 shallots, and 3/4 cup each of dried lima beans (I didn't presoak them) and cranberries. Finally, I added some salt for flavor, and the special ingredient, 3 tablespoons of maple syrup (Grade A, in this case). I covered it all in water and about 4 cups of roasted chicken broth I had in the freezer (again, a nod to modern conveniences), and slow cooked it on HIGH for 6 hours. This is despite the Basic Venison Stew advisory that in the slow cooker, you get a stew that tastes like it has "already been reheated several times." Six hours later, I come back in from work, and the apartment smells too good. My first thought is: no, this probably won't taste like it's been reheated several times. In fact, this venison stew, which was very much thrown together on my part, had a very nice venison flavor, even though there were so many vegetables that it was easy to lose the venison in between them. The least good part about this stew was the acorn squash, which was a little mushy, but I expected that with squash. It was a nice, hearty stew of (predominantly) native North American ingredients. 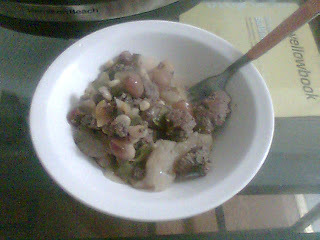 The cranberries added a nice tartness, and took on the color of the venison. The lima beans, thrown in unsoaked, ended up perfectly firm yet not hard. The maple syrup, unfortunately, got completely lost in the stew, as I could hardly find it even though I was looking for it. In the future, if I want any kind of maple aftertaste, I will need to add at least twice the amount that I did. The perfect accompaniment for this stew is wild rice. Technically not "rice" as we think of it, it's the only grain that is indigenous to the Eastern Woodlands (maize was brought in from Mesoamerica, so it's not exactly "native" to this area). I had never prepared it before, and it's quite easy: just dump 1 part rice to four parts water in a pot, boil, cover and simmer for 45 minutes. It didn't even burn to the bottom like regular rice. Just a note: I got mine from Trader Joe's, who sells two types of wild rice. One is organic, from Saskatchewan, and sells for $3. The other, which is the exact same amount of wild rice and is not organic, ends up costing $5. And the cheaper one has a ziploc top! I have no idea how this slipped by the powers-that-be at Trader Joe's. I hope they don't read this post, find out their mistake, and jack up the price of the organic bag. I have enough stew to last me a week. I can only imagine how far a much larger pot of stew, with a whole deer, would've lasted an entire family or village!